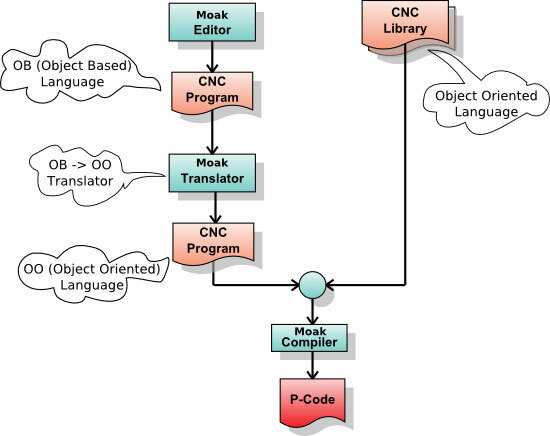 Moak is a systems software for computer numeric control (CNC) machine and a development environment for CNC programming. What is a CNC. A CNC machine is a computer controlled machine tool able to execute a program to fabricate an end-product. Moak has been developed for a company machine manufacturer. Moak functionatilies serve machine manufacturers but also machine customers that can customize the machine behaviour. Machine manufacturer companies use Moak to develop the driver library for the different parts of the machine (pick and place, soldering, shuttles, etc.). The Moak developing and monitoring module are written in C++ and Delphi under Windows. The execution module is integrally written in C++ and run under QNX (a Unix-like real time operating system). All the code is OOP. The following picture shows the relations between some Moak entities. To control a CNC machine, Moak permit you to write two different type of codes. A CNC program to perform the manufacturing. The CNC program is compiled in P-Code and then ready to be executed on the embedded pc that control the machine. MOAK execution module runs inside one or more embedded pc under the real-time operating system QNX. This part is responsible to execute the CNC progam (the P-Code of the CNC program). For instance it runs instructions like "move the X axis to location 35". In this case Moak needs to manage the acceleration, the final velocity, and deceleration of the axis. Moak also periodically checks (with frequency in the order of millisecond) the axis position and in case of wrong position it corrects the velocity. 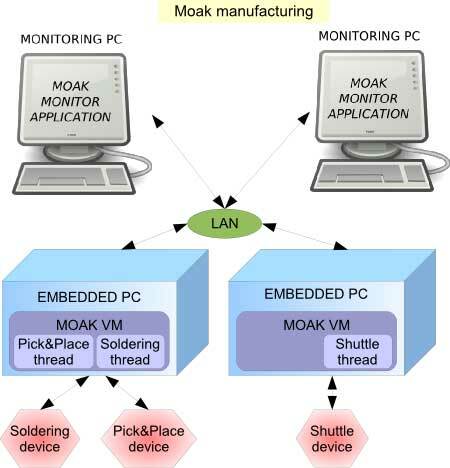 In complex environments where Moak manages many embedded pc, each pc has different resources associated (a pc is connected to a loading unit, another to a soldering etc.). Even in this case the CNC programmer writing the soldering routine does not need to know wich pc is the pc connected to the soldering. The programmer just needs to specify the object "soldering". Moak knows wich pc the soldering device is connected to and it runs the soldering routine on the correct pc. Furthermore the CNC programmer accesses the soldering using high level command. In standard CNC world to open a clamp of a soldering device you should indicate the output port of the clamp. With Moak, you simply write "Soldering.Clamp.Open". In a Moak system there are one or more PCs along the production line to monitor the manufacturing process. Each one of these PCs runs a Moak monitor module on Windows. Through the monitor PC it is possible to check the manifacture status but also to start, stop, or end the process. The other PCs in a Moak systeam are embedded PC built on QNX real-time operating system. Inside these PCs it runs the Moak Virtual machine that execute the P-Code of the user CNC program. Each CNC program is a set of threads driving a mechanical devices like Pick and place, Shuttle etc. The embedded PC are phisycally connected to the mechanical devices. Monitoring PCs and embedded PCs communicate through a LAN with TCP/IP and UDP. Following is a list of component/technologies Moak contains.